MetroRapid – What is Tampa Really Getting? After months of planning and work, the first BRT line in the history of the Tampa Bay area is set to launch on May 28th. A map showing the proposed BRT and light rail network. When the Hillsborough light rail referendum failed at the polls in 2010, HART changed their plans and started moving forward with plans for a BRT (bus rapid transit) system to be overlaid over the existing bus network, which included expanding service into new parts of Hillsborough County. 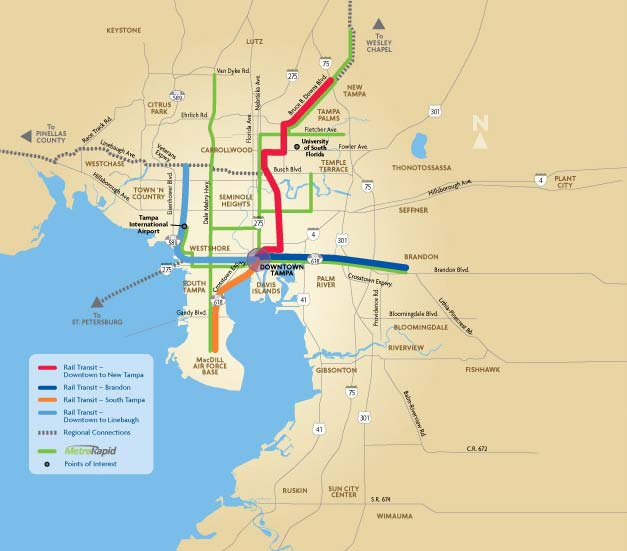 While more of a consolation prize for the light rail network that advocates had been hoping for, it was hoped that a BRT network would be the start of the future HCT (high capacity transit) network that would span the entire Tampa Bay area. Below, I have the schedules for the North-South line. Northbound service will see 56 trips, while southbound service will see 57 trips. With the exception of the 10:55AM NB trip, the North-South line has been scheduled to keep buses spaced at 15 minute intervals throughout the day. One immediate issue that can be noticed is the 30 minute headways between UATC and Hidden River Park-and-Ride. While I can’t say that HART never disclosed this fact (though its not exactly easy to find any mentions of it), I’m fairly certain that many if not most of the potential riders on the North-South line are going to be unaware of this. Apart from the various employment centers in Telecom Park, the main draw in this area will be the park-and-ride, which has 320 spaces. Officials at HART have indicated that the hope for this park-and-ride is to draw people currently commuting from the northern suburbs along I-75 to transit. 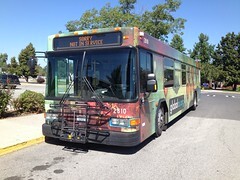 Currently, there is a park-and-ride operating about 3 miles to the north using the parking lot at Lowe’s. There are also two other park-and-ride lots further north, both which use the parking lots of churches in neighboring Pasco County. With only two AM trips and two PM trips in the peak direction on Route 51X, there isn’t much demand for service in this area currently. As of February, Route 51X is only average 16.2 passengers per trip, so it’s a bit of a “hail mary” to hope that commuters will be drawn to this new park-and-ride facility with the all-day transit service. Arguably, the time savings isn’t that great, even though the North-South line only has 23 stops northbound and 24 stops southbound between MTC and UATC (compared with Route 2’s 74 stops northbound and 73 stops southbound). However, it does fit in with the 10-15% time savings that officials have been advertising. To help improve the North-South line’s performance, TSP (transit signal priority) will be used on selected segments. The first TSP segment is on Nebraska Avenue between Cass Street and Floribraska Avenue, and the second TSP segment is on Fletcher Avenue between Nebraska Avenue and 42nd Street/Palm Avenue. On the Nebraska segment, there are 7 stoplights with TSP: Cass, Scott, Henderson, 7th, Palm, Columbus, and Floribraska. On the Fletcher segment, there are 8 stoplights with TSP: Nebraska, 15th, 22nd, Livingston, Bruce B. Downs, Magnolia, 42nd, and Palm. It has been indicated that there are plans to install TSP on the other 36 stoplights along the North-South line. Along the North-South line, riders will see three different styles of stations: “A,” “B,” and “C.” All three station types feature similar features, with MetroRapid-branded shelter along with a wayfinding totem. The”A” station is the most basic design, with just a shelter awning and a information board. The “B” station features a larger shelter and seating as well. Also important is that the “B” station is designed to have a TVM (ticket vending machine) installed, though only one pair of “B” stations will have them at the opening of the North-South line (Magnolia). For most of the stops, a “B” station has been installed, partly because they can be later upgraded to a “C” station in the future. With a larger shelter than the “B” station and TVM’s located at every one of them, the stops with a “C” station are those that are anticipated to produce the highest ridership. Along with MTC, Jackson/Pierce in downtown, UATC, and Hidden River Park-and-Ride, there are just four “C” station pairs: Martin Luther King Jr. Blvd, Hillsborough Ave, Waters Ave, and Fowler Ave.
With just 14 TVM’s currently in place along the North-South line, any sort of off-board payment system is going to be largely unattainable. 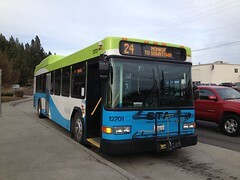 As of this writing, there has been no announcement from HART regarding fare payment policies for MetroRapid, so one is left to assume it will be the same as the current policy for regular fixed-route service: Boarding through the front doors only, where riders can pay with cash or swipe their farecards. HART is anticipating that a large majority of the current riders on Route 2 will start using the North-South line. However, without a major change to fare payment policy, the North-South line is likely destined to become bogged down by cash fare payments just as Route 2 does currently. It is important to note that HART recently announced a plan for a major farebox upgrade that will support the use of smart cards (along with the possibility of inter-agency cooperation with PSTA and other neighboring agencies), so there may be hope for the future. With all the potential issues it faces, I find myself cautiously optimistic about the beginning of the North-South line. It does have a heavy ridership base to build upon (as Route 2 is HART’s busiest route, averaging ~4,300 passengers per day), and with continued growth along the Nebraska Avenue corridor that number can only go higher. As an actual BRT route, it has a long way to go, but as mentioned earlier there are budgetary constraints and so this is about all that can be done at this point. I do fear that regardless of failure or success, the MetroRapid system may end up plotting the destiny for the future of transit in Tampa Bay. If it were to fail, naysayers could point to it and say that it proves there’s not a need to expand transit in the area. If it did succeed past expectations, then it would be harder for advocates to press for more. At this point, all we can do is wait and see. 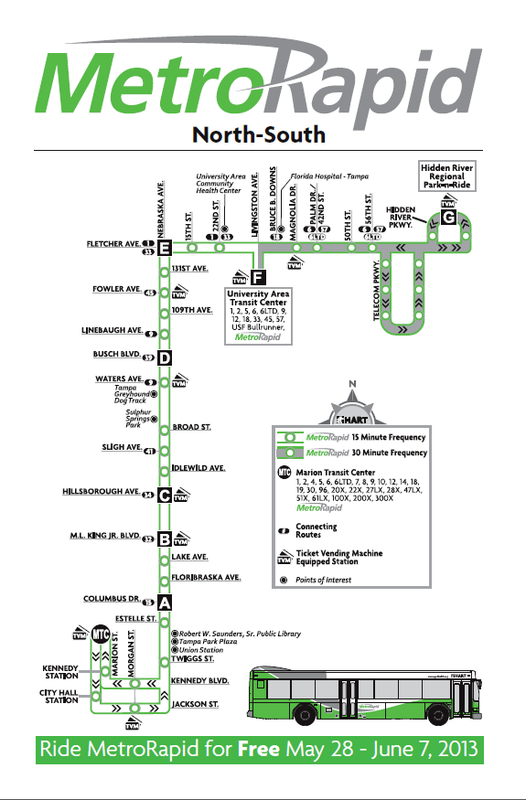 UPDATE 8/8/13: Since originally uploading this post, there have been some changes made to the MetroRapid North-South line. Back on June 7th, HART announced that effective immediately, the North-South line would not be using the Marion Street Transitway, but rather Morgan Street (one block east). With the beginning of the next mark-up (service change) on August 18th, this detour will officially become permanent. I’m not at all surprised that this was done, as I fully expected that MetroRapid buses would become bogged down on the Transitway as every other bus already does due to traffic signals running on a timer system. Unless HART and the City of Tampa find a way to solve this issue, I doubt that the North-South line will be returning to the Transitway. 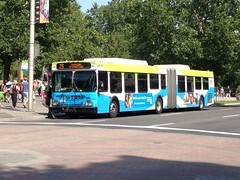 Also note that the issue with the 10:55 northbound trip has been fixed and it now leaves Marion TC at 10:45. *All the information shown in this post is an aggregation of publicly available data and cannot be claimed as copyrighted or proprietary.